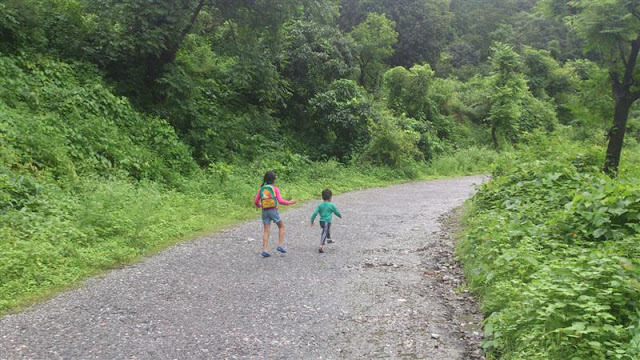 Last Monday, we went out on a long drive to the hills after a long time. Thanks to the public holiday that the much awaited plan could materialize. We went to the Bhimtal road, where, during the monsoons, the villagers erect temporary sheds on the road in which they roast corns which are plucked fresh from their fields. They serve the corn with a variety of chutneys which truly deserve to be called exotic. Garlic-lemon chutney, green mircha (chilly) chutney, bhanga chutney, bhangeera chutney or simply with lemon and salt. Corns grown in the hills are sweet and soft. Perhaps it is the weather of the hills that does the magic and infuses the milky sweetness which is not found in the corn grown in the plains. Our lunch was taken care of, as we ate to our heart’s content. 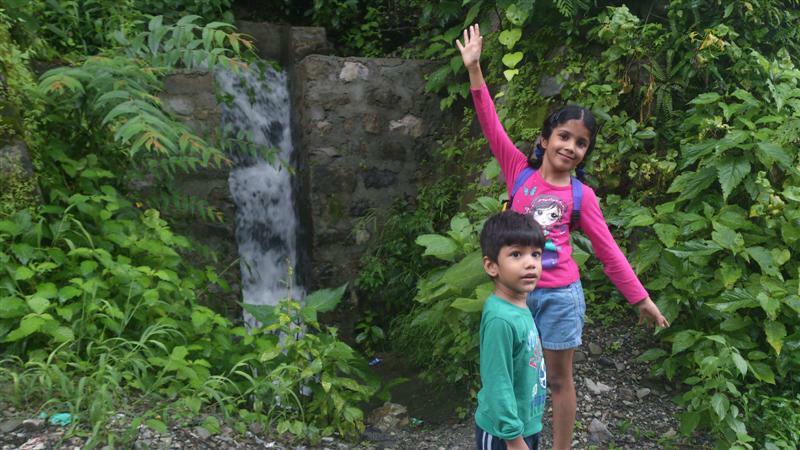 It had just stopped raining and there was sound of rain drops falling from the trees, gurgling of the tiny brooks on the sides of the road that come into life after a heavy downpour and water falls that empty into small gorges. How could one not go on a long walk in such a beautiful weather? Communion with nature is always calming for the jangled nerves which are bestowed upon by the rigours of modern living. It was therapeutic to watch the swollen river, the green fields, the fog rising and falling in the valley ………… while we were savouring the marvels of nature, our kids were chasing butterflies, stopping the crabs from coming on the road, collecting stones, washing their feet in the waterfalls thus enjoying their day out. Back home, we were tired. For dinner, my husband made a veggie while I made Irish Brown bread. 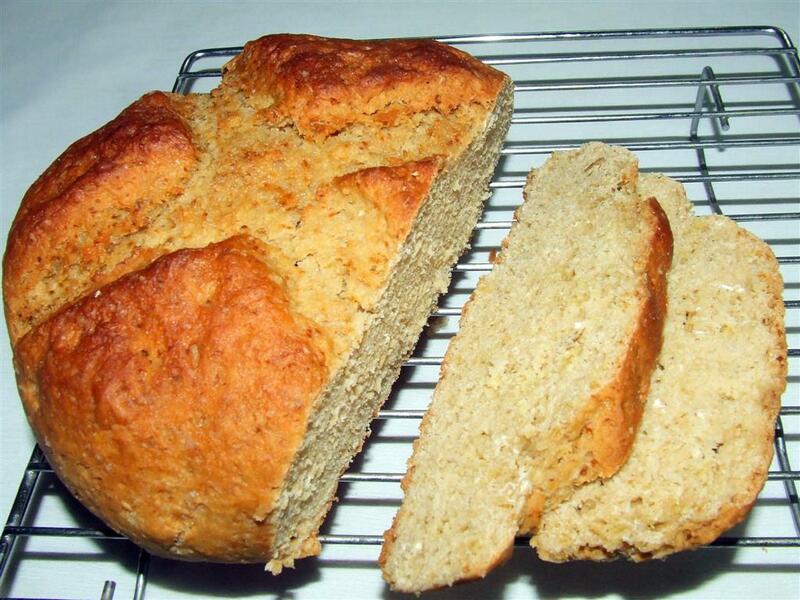 Irish Brown bread is one of our favourite breads. We love its sweetness, softness and flavour. I bake it often when I am in no mood of making chapattis. 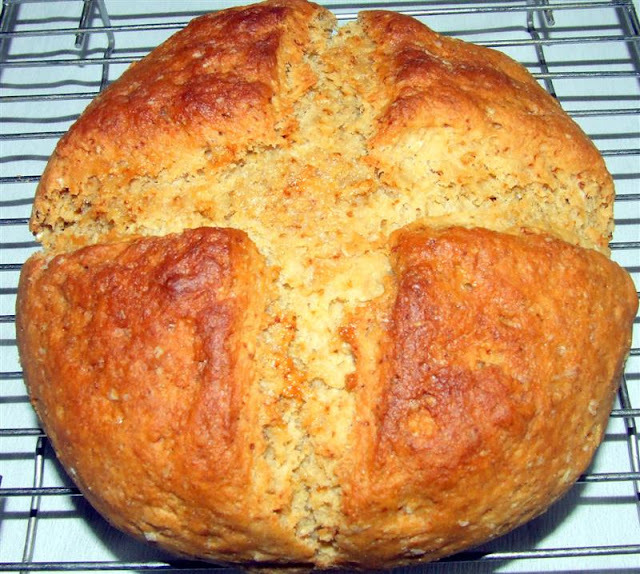 A very simple to make bread that goes well with veggie and a slice in the end with jam or honey makes a perfect sweet portion to end the meals. Mix together all whole wheat flour, all purpose flour, oats, sugar, salt, baking powder and baking soda. Add olive oil and mix well. Knead the flour by adding a little curd at a time. The dough should be soft. It should not be sticky. Knead well for about five minutes. If the dough feels dry, add some milk. When the dough is ready, shape it into a ball. Place it in the greased baking tray and cut a large ‘X’ on top of the loaf. Bake in a pre heated oven at 190 degrees C for about 40 minutes. 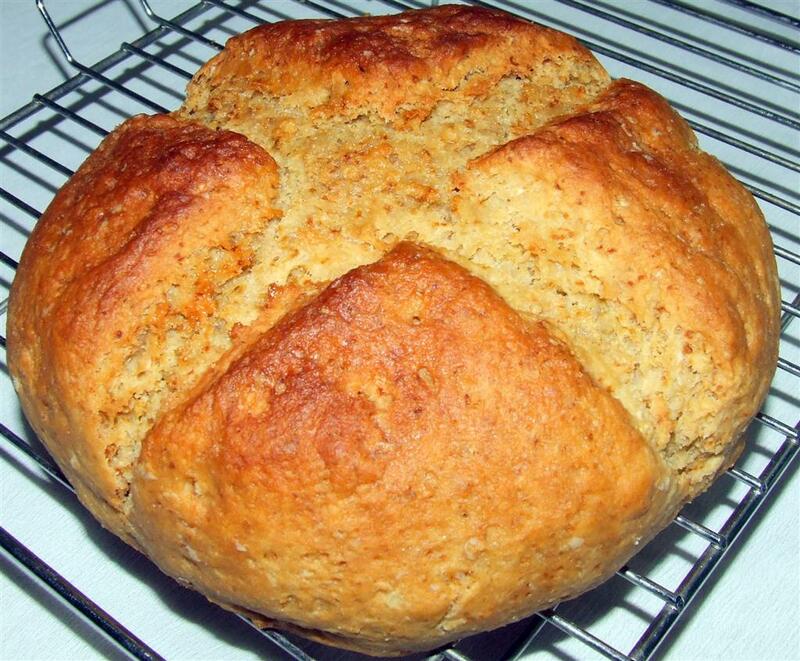 The top turns golden brown and a nice sweet aroma emanates when the bread is done. Transfer the bread to a rack to cool. Is the sugar essential? Or can one miss that out? Hello! Well, sugar is not essential. You can lessen the quantity or avoid it totally. Thanks for visiting my blog. Good wishes! Hi, i loved the recipe...what are rolled oats? any specific brand? Hello!, I used the oats available in the stores. They are rolled oats. Brands like Quaker, Savour and Champion are available in the stores. 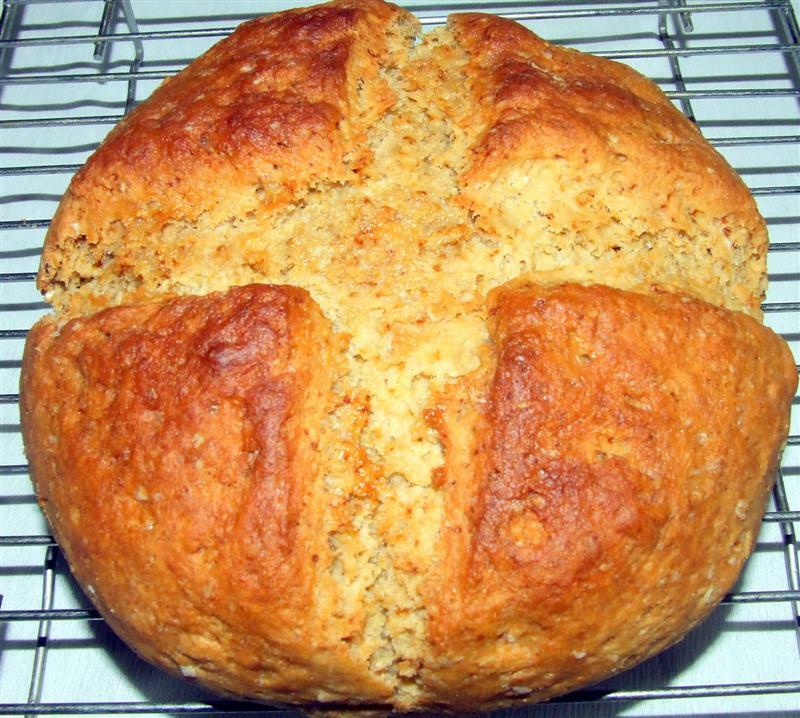 Hi Divya, Traditionally, soda breads are shaped like a ball and then given cuts that make a cross. I have never tried baking it like a loaf. But baking is all about experimenting. Go ahead and enjoy your adventures. Happy Baking! Can I substitute ragi instead of all purpose flour?